A year ago my husband and I walked around Babies R Us in a daze. We were surrounded by dozens of items claiming to make our child safer, stronger and smarter. Everything seemed to have won an arbitrary parenting award or was the “#1 Pediatrician Recommendation” As I stood there trying to figure out which of the 17 styles of bathtubs would be best for my unborn child, I realized I hadn’t done my homework. I didn’t need to read manuals or consumer reports. I needed to talk to parents in the trenches. Parents who were currently raising a newborn or young child and were using these products daily. I hightailed my bulging belly out of the store and logged on to Facebook. I sent a request out to all parents for “must haves” to place on my baby registry.I immediately received dozens recommendations for what items were absolutely needed and what would collected dust. Those suggestions from weary, spit-up covered parents turned out to be 100% spot on. Now I have several friends who are navigating the terrifying world of preparing for parenthood and have come to me for advice. As I started to rattle off suggestions, I thought I would create a list that I could share. Then I realized that many fellow practical parents also read this blog and they probably have suggestions too. Voila! Instant blog post! (I've been uninspired the past few days) Here are few things I couldn’t live without once Max with born*. This is one of the most expensive monitors out there but the peace of mind it provides is worth every last penny. 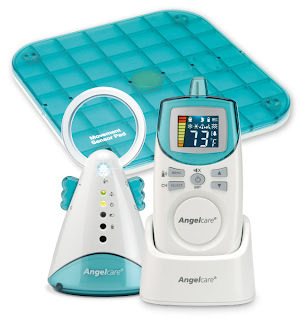 Not only does it offer a clear sound quality but it also monitors the baby’s breathing. If it doesn’t sense any movement for 15 seconds an alarm goes off. Sure the occasional false alarm scares the hell out of me but its worth the mild heart attack. This is a rather new addition to my diaper bag and I so wish I would have tried it sooner. It’s an old-fashion skin cream that performs miracles on even the worst diaper rash. It’s hard to find so I didn’t get it when my friend Kim (Hi Kim) first suggested trying the product. However, just last week when Max got the worst rash I’ve ever seen, and nothing else worked, I took her suggestion and found some at a local pharmacy. Within 24 hours the rash we had been fighting for days was gone. Sometimes, this is the only thing able to distract my screaming child long enough for me to use the bathroom. It doesn’t matter if it’s covered in flashing toys or one little whirligig. Since he was 3 months old, the kid loves him some exersaucer. 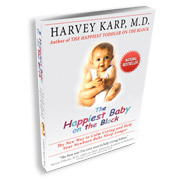 4) Book- The Happiest Baby on the Block-Dr. Karp. The advice in this book was the only thing that helped me survive those trying first three months. The book reads a bit like an overly enthusiastic infomercial and 100+ pages could have been pared down to about 10, but the “5S” system was the only thing that worked in getting Max to calm down when he started screaming. This isn’t the baby. It’s for you. Back in the infancy of my blog, I discussed my affinity for this machine. Coffee is and was my saving grace. Weekly, coffee pushes me onto solid ground when I'm teetering on the edge of insanity. When time is limited and I’m too exahausted to see straight, throwing a K-cup into a machine and hitting a button is so much easier then the steps required to make a pot of joe. Babies R Us should really allow parents to add this to the registry. So fellow parents! Help some mom and dad's to be out. What products made that crazy time in your life just a little bit easier? * None of these companies are paying me to stay nice stuff. I just really like their products.